I am totally into word games. And can never wait to solve a new puzzle that comes my way. But sadly, all word puzzles today are about jumbled letters. One has to either make as many words, or the longest word, from the given letters. Be it scrabble, boggle, ruzzle.. you name it. Nothing new has been introduced in a while…until now! Finally there is an innovation in the world of word puzzles!! Signtist © is a unique concept which has been copyrighted in over 130 countries. So, in essence it is a ‘new to the world’ idea. It is a pattern based word puzzle and has the potential to take on various languages and still be as appealing and interesting. Signtist © is a game which can sit right next to a crossword in a newspaper or sell at bus stations as booklets. It is the new sign language! Signtist © puzzle book is a lovely travel partner. The books are very compact and handy. With more than 8 variations to choose from, the books make for a nice brain teaser. From categories like – animals, countries, brand names and movies to easy, medium, and difficult, the books have it all! There are creative clues behind each pattern. And answers are at the back of the book. What you gift says a lot about you! Priced reasonably between 125-250 rupees each, the Signtist © books have 50-100 puzzles respectively. The bundled boxes make for a great gifting option for your children, nephews, nieces and even corporate employees. These combo boxes are available at Rs.370 onwards. For attractive discounts please click on the link below and get your first copy! 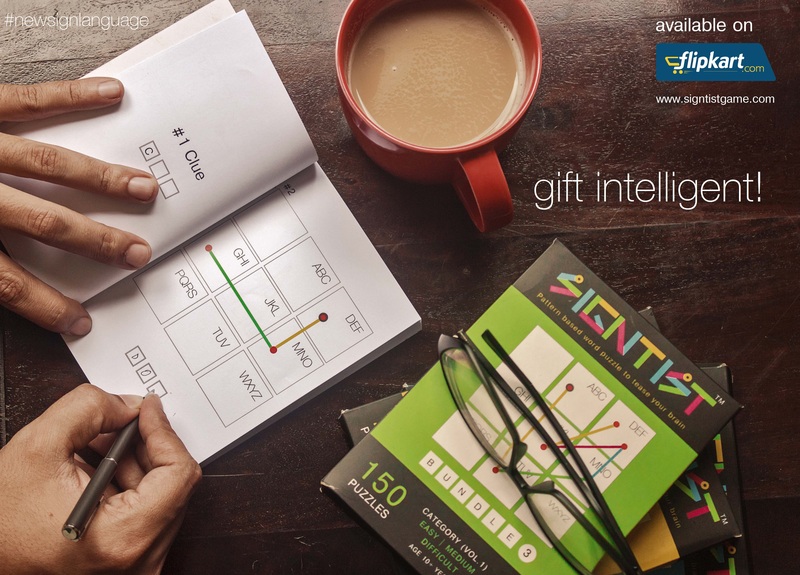 For BULK ORDERS or CORPORATE GIFTING solutions call +91-9731884542 or mail at signtistgame@gmail.com.